Queneau’s Exercises in Style is a thrilling masterpiece and, in fact, one of the greatest stories in French literature. On a crowded bus at midday, Raymond Queneau observes one man accusing another of jostling him deliberately. When a seat is vacated, the first man appropriates it. Later, in another part of town, Queneau sees the man being advised by a friend to sew a new button on his overcoat. Exercises in Style, Queneu’s experimental masterpiece and a hallmark book of the OULIPO literary group, retells this unexceptional tale in ninety-nine exceptional ways, employing writing styles such as the sonnet and the alexandrine, onomatopoeia and even Cockney. A 65th Anniversary Edition includes twenty-five exercises by Queneau never before published in English translated by Chris Clarke, as well as new exercises by contemporary writers Jesse Ball, Blake Butler, Amelia Gray, Shane Jones, Jonathan Lethem, Ben Marcus, Harry Mathews, Lynne Tillman, Frederic Tuten, and Enrique Vila-Matas. We’re indebted to Barbara Wright and Chris Clarke for their having completed the exercises they have by translating them into English. What makes Exercises in Style so interesting is that, though one can read it from cover to cover, it’s a book that survives and indeed triumphs simply from its sheer ambition. What makes the book compelling is seeing this same, banal tale told through a huge variety of literary styles, from science fiction to rhyme, haiku to official letter. The variety in its repetition becomes at first odd, then hilarious as more and more absurd forms are chosen. Exercises in Style was a revolution, a book that proclaimed its powerful ideas simply by pursuing their iron logic. It will remind you of just how weird and infinite human language is. Exercises in Style is an irresistibly simple and frequently hilarious demonstration of the potential of language. It’s fair to say that Exercises in Style turns the current thinking about writing entirely, and brilliantly, on its head. It’s a testament to Queneau’s ability as a writer, and just as interestingly, it sort of blows apart the idea of how many ways a story can be told — and how style can be more important than content. His book becomes an exercise on rhetoric itself, indeed a kind of demonstration that rhetoric is to be found everywhere… Once Queneau had thought up the Exercices de style, it was like inventing the wheel – everyone can run with it, as far as they like. 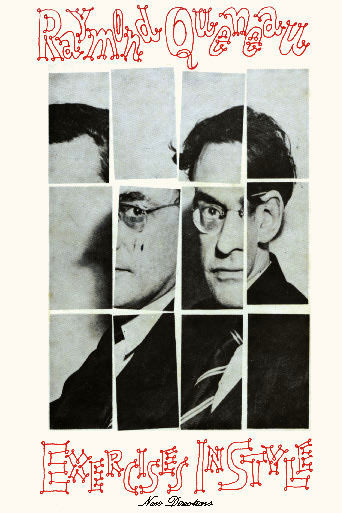 Queneau’s masterpiece, Exercices de style, in which an anecdote of the utmost banality is told in different styles, gives rise to a whole range of wildly diverse literary texts.